The last remaining action item left to resolve on the DOG Aviation RV-12 was the Precision Aviation Inc. PAI-700 vertical card compass. The PAI-700 vertical card compass is installed as a backup just in case the Dynon Skyview develops a problem while in flight. I knew prior to going into it that mounting a vertical card compass in an instrument panel can be a tricky proposition, in that, panel mounting subjects the compass to magnetic interference from the surrounding instruments and wiring. From what I’ve read, apparently vertical card compasses are much harder to adjust when panel mounted compared to the typical aviation whiskey compass. As you will read below, many many hours were spent trying to get the PAI-700 compass to work correctly, but it was just not to be. Also, yes, I know there were hangars in the vicinity and the aircraft was not at a compass rose. But that said, I figured there was no point heading out to the compass rose until the backup compass can be made to display readings somewhat close to the Dynon SkyView's magnetometer (which was calibrated at the compass rose) . 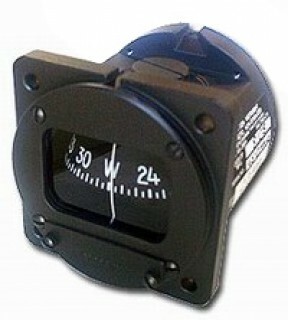 The Precision Aviation Inc. PAI-700 vertical card compass. Magnetic compasses used in aircraft have built-in compensation screws that are adjusted to correct for minor deviations in the magnetic field created by the instruments, wiring and surrounding structures. There is a compensation screw for making North/South deviations and another screw for making East/West deviations. To adjust the compass, the nose of the airplane is positioned towards the four cardinal directions and the appropriate compensation screw is turned to hopefully swing the compass to correct for heading errors. This adjustment or calibration process is called “swinging” the compass. The manufacturer suggests tapping the compass gently while positioning the aircraft which is what we always did for every directional change mentioned below. Last fall the first attempt to swing the PAI-700 at the airport's compass rose resulted in a dismal failure, in that, the compass deviations were so far off the compensating screws could not correct the error ... the North/South readings were OK but the East/West readings were WAY off. 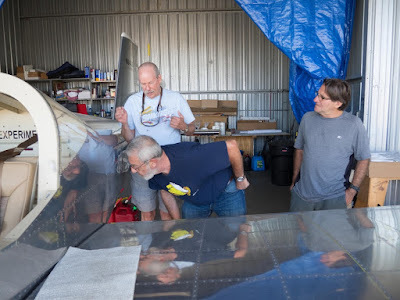 Since this was a backup instrument anyway, swinging the compass was placed on the back burner, so to speak, to be taken up again the next time the forward top fuselage skin was removed. In the meantime the DOG Aviation procurement department purchased a couple of items that sometimes allow the PAI-700 compass to become calibrated or “swung” as it is called. Items purchased were a pair of balancing balls and a product called Mu-metal. The balancing balls are akin to those used on ships to compensate for all the metal in the bridge or wheelhouse surrounding the compass and can typically be seen on either side of the ship’s compass. The balancing balls contain magnets and rotating the balls one at a time helps compensate for the magnetic interference surrounding the compass. Mu-metal on the other hand is a specialized nickel alloy sheet that is made from a blend of 80% nickel and 20 % ferrous material which has been annealed. Mu-metal passes magnetic lines of force very easily so it can be used sometimes to “shield” unwanted magnetic fields from the compass. The compensating balls for the PAI-700 vertical card compass. Compensating balls installed on the back of the PAI-700 vertical card compass. The compensating balls were installed first and although they helped, there was still not enough adjustment available on the internal compensators of the PAI-700 compass to be usable. During the midst of fussing with the PAI-700 compass DOG Aviation was visited by the three Weiss guys from Michigan and their brother in law Carl from Indiana. 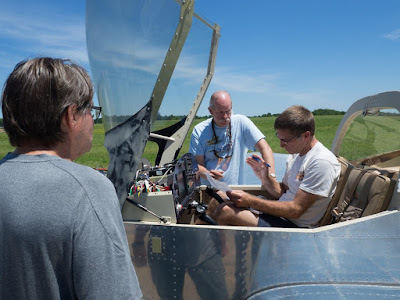 Of course, I jumped at the opportunity of having slave labor available and quickly enlisted the help of Karl to help me position the aircraft at various headings using the Dynon SkyView's magnetometer then adjust the PAI-700. We spent quite a bit of time following the adjustment procedure supplied with the compensating balls only to find out after aligning the compensating balls as best as possible there was still not enough control using the compass’s internal compensating screws to make the necessary adjustments to swing the compass. 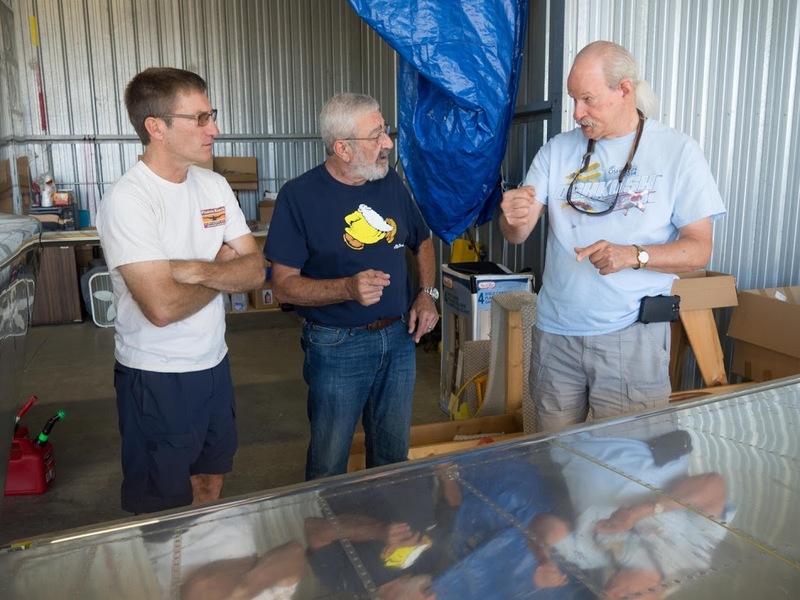 Left to right - Karl and Carl listen to an explanation of how easily the wings can be removed on the RV-12. Karl lending a hand calling out the Dynon SkyView compass reading while the aircraft was being positioned so the PAI-700 compass could be adjusted. After cooking Karl for about a half hour or so under the canopy in the hot sun, we discovered it made no difference in the compass readings if the canopy was left open so we just left it open. Kurt looking on as brother Karl records the compass readings as we attempted to swing the PAI-700 vertical card compass. Unfortunately, the third Weiss guy, John, was manning the camera and didn't make it in any of the images. Thanks for all the photos John. Once it was determined compensating balls alone were not enough to swing the PAI-700 compass, decided to begin playing with the Mu-metal. I though the majority of the magnetic interference was coming from a couple of nutplates adjacent to the compass but playing with the Mu-metal it became quickly apparent that was not the case … the major change came when the Mu-metal was slid between the compass and the vertical speed indicator directly below the compass, in that, the compass position moved at least 90 degrees when the Mu-metal was slid underneath the compass.. So with Karl’s help, it appeared the Mu-metal would work as the compass began to show hope that it could now be adjusted much closer than previous attempts. We ran out of time for more testing so the next day I glued the Mu-metal down onto the top of the vertical speed indicator and extended it across the top of the glove box (almost in the same position used during testing) using silicone RTV. The Mu-metal was placed over the top of the vertical speed indicator and glued in position with RTV. A water bottle, clamp and drill V blocks were used to weigh down the Mu-metal while the RTV cured. The completed Mu-metal instillation makes a magnetic shield for the backup compass. The following day, enlisted Bernie to help with the positioning of the aircraft and recording of the readings. Here again, had to start from scratch and first adjusted the compensating balls as best as possible then moved on to the internal compensating screws on the compass. At one point, it looked great for the cardinal headings but the in-between headings were still way off. Bernie and I fussed with it for a very long time and ran out of time before getting the issue fully resolved. But we did notice some flaky behavior, in that, once a heading was established it was not always repeatable …. As an example, once North was spot on turning to South may be say 7 degrees off ... the instructions say to use the adjuster and take out half the error. OK once that adjustment was made turning to north would yield a reading of say 2 or 3 degrees off … rotating back around to south could result in a reading that was 15 or 20 degrees off! By the way, as the airplane was being rotated around the compass was being lightly tapped as suggested to mitigate the internal drag from all the gears. (We also tapped prior to and after making an adjustment). I felt we were close and wanted to try tweaking the compensating balls a little more but that would have to wait until the next work session. Bernie lending assistance to help with the swinging of the PAI-700 compass. For the next work session enlisted the help of Jan to help with the positioning and recording the compass readings after readjusting the compensating balls and then the internal compensators. The readings were still flaky, so I decided to rip out the PAI-700 and just replace it with an Airpath whiskey compass shown below. The Airpath C2300 whiskey compass. With assistance from Jan, was able to swing the Airpath compass after just a few minutes of adjusting and it is within a couple of degrees for most all the headings. In order to swing the compass, the East/West compensation screw is turned full counterclockwise to its stop. That got me thinking, perhaps I don’t need the Mu-metal … so I removed the Mu-metal out of curiosity just to see if the compass could be swung and discovered the East/West readings were so far off they were not adjustable using the internal compensators … so I glued the Mu-metal back in place and now all is well again. The back of the Airpath C2300 whiskey compass that will be replacing the seemingly unusable PAI-700 vertical card compass. Note the sheet of Mu-metal isolating the vertical speed indicator from the compass seems a little crinkled now that it was removed then reinstalled … it was necessary to keep the Mu-metal to allow the Airpath compass to be successfully swung. Panel view of the new backup Airpath C2300 compass. Was able to be successfully swing the Airpath with no muss or fuss ... but it did require a Mu-metal shield. Still need to change out the mounting screws to match those used on the other instruments. 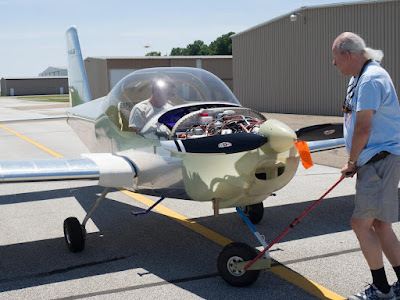 Of course, the Airpath C2300 compass was swung without the upper forward fuselage skin in place … so there may be a little more adjustment necessary once that is screwed in place. Have been using 8-18 stainless screws so they should have very little effect on the compass readings. But won’t know for sure until later in the week after returning from attending AirVenture in Oshkosh. Out of curiosity at some point in the future I may try to reinstall the PAI-700 again and see if it works better while actually flying … but I’m not very hopeful about that.